Update: NIS America has provided an update to the demo being revoked and the release date of Disgaea 5 Complete being delayed. “Thank you everyone for your enthusiasm regarding the Disgaea 5 Complete release on PC. As beta testing has been ongoing, we have been fixing bugs and issues as they were discovered. While working on corrections last night, we came across a new issue that requires additional attention that will take more time to resolve. Unfortunately, until this issue can be resolved, the release date will be postponed, and we are now targeting a release for Summer 2018. We offer our sincerest apologies to all who have been looking forward to this release of the game. At this time, we would also like to address the concerns of our fans who pre-purchased this title. We will be posting updates as we continue to resolve the issue. The game can be re-installed as soon as the issues have been corrected. We understand that the change in release timing may affect user experience, so as an alternative, we will also be presenting a refund option. The company is also offering refunds for anyone who had already pre-ordered the game via Steam. Those who did pre-order can head here to get their refund. So there we have it, the keys were revoked due to the title being delayed. A little heads up prior would have been nice. Sadly, it seems that NIS America keeps running into one issue after another. First the localization efforts with Ys VIII, then the PC port mess. Now, the delay with Disgaea 5 Complete. 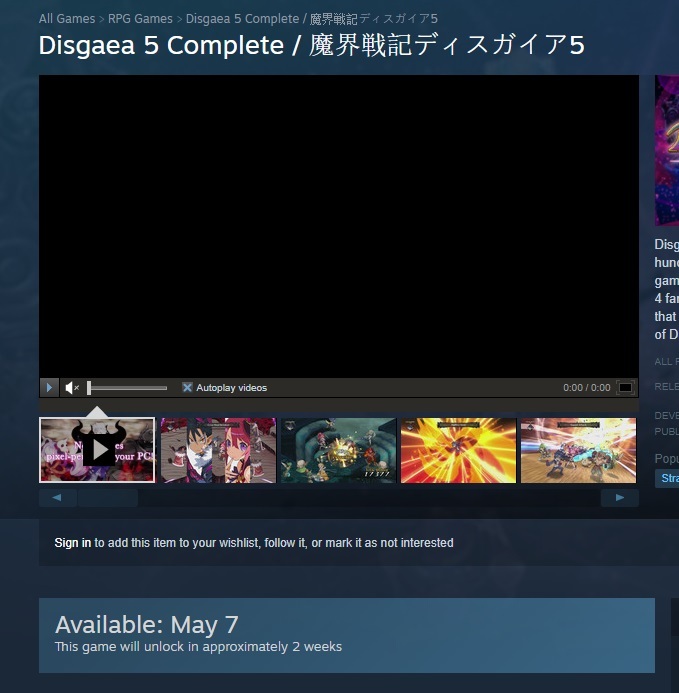 Yesterday, a demo of Disgaea 5 was previously made available on Steam. However, those who had downloaded the demo noticed that it was a bit different compared to the Nintendo Switch version. Instead of having the first chapter available for play. The PC demo allowed gamers to play up to chapter 3. This caused some confusion as the length of the demo wasn’t specified by NIS America. Which led many to assume that perhaps a mistake was made. Similar to what Sega did with Yakuza 6. Now it’s been brought to light that NIS America has been revoking the very same demo keys. Over on the official Steam forums, threads have popped up confirming that game keys have been revoked, with no reason as to why. You can check out this threads here and here. The demo was supposedly going to last up until May 21, 2018. In addition to this, the original release date that was set for May 8th, 2018, has been removed. Currently the store page has no release date, however, if you check the web cache you can clearly see that there was a release date prior. There hasn’t been any word on if the game is being delayed either. We’ve reached out to NIS America to see if they’ll comment on what’s going on. We’ll update the story if/when we hear back from them.